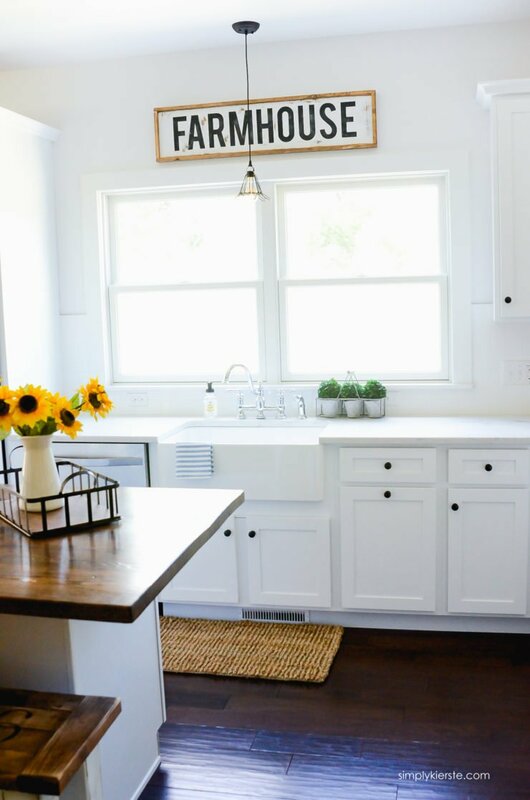 From the moment the kitchen at Old Salt Farm started taking shape, I knew exactly what I wanted to go over the windows–a Farmhouse Sign. I even knew exactly how I wanted it to look– a wooden frame for contrast against the white walls, and a classic plain font. In the weeks before we moved in, I was busy getting a myriad of projects finished up, and this was one of them! It turned out exactly how I wanted to–I LOVE it! 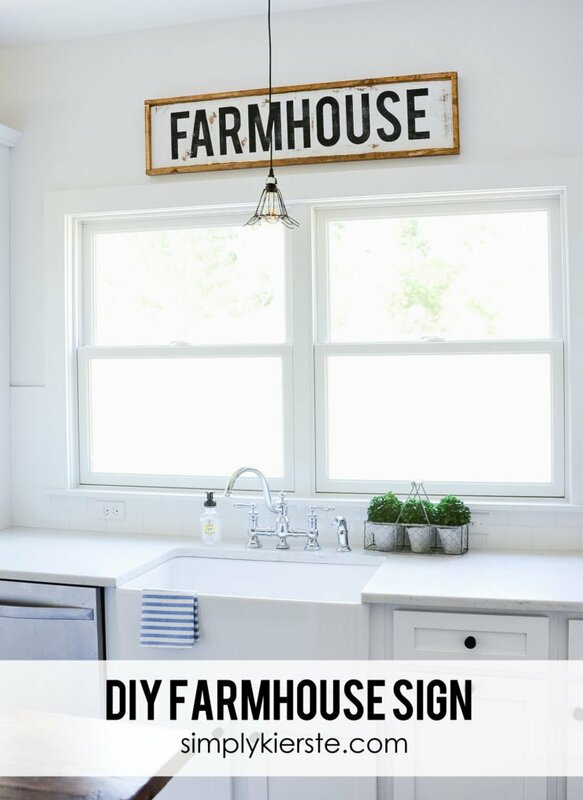 It’s an easy project, so if you’re looking for a farmhouse sign for your home, give this one a try! 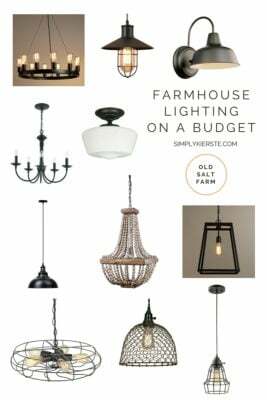 I just love the way it looks, and it really is the perfect touch in my farmhouse kitchen! I’m going to give you a step-by-step tutorial on how to make your own framed wood sign. If you’re interested in different text, you can follow the same directions, and just change out the wording. Easy peasy! I made my sign to fit my space, and you will do the same–just make the measurements whatever you need them to be. *Affiliate links are included below for your convenience. If you click on a link and make a purchase, I make a small commission, but you don’t pay any extra. //Cut the board into the desired length. //Using a lint-free cloth, stain both the 1×8 board and your furring strips. 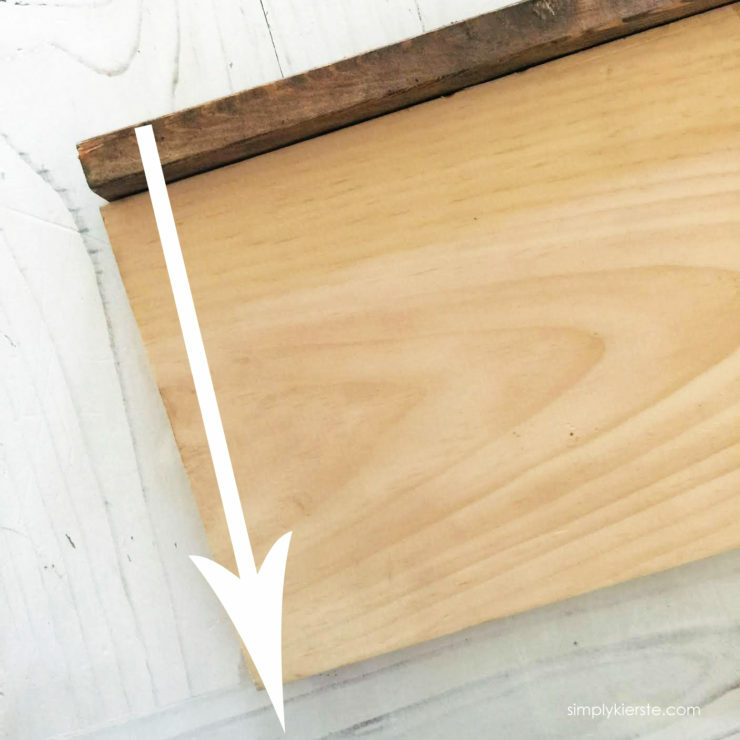 It’s easier to stain the furring strips before cutting for measurement purposes, especially if this is your first time making them. You only need to stain the top of the 1×8, but you need to stain the top, sides, and bottom of the furring strips, because all of it will show. Let dry completely. //Give the 1×8 board a coat or two of white latex paint, until the stain is completely covered. Let dry completely. //Apply your stencil and paint on the text. I use my Silhouette Cameo to cut out the vinyl, and then use the negative space as my stencil. I also like using spray paint to add the lettering, which might sound funny! I spray it on to a paper plate (not foam–it will eat it), and then use a foam brush to apply it to the board. I’ve found that spray paint will hold up better than craft paint, especially because I sand over the text and board to distress it. If you do use craft paint, and plan to distress the text, be super careful, and even sand it by hand–a power sander can remove all of the text in just a second or two! It also takes a lot of coats of craft paint, and I can usually get away with only one, maybe two of the spray paint. //Once the paint of your text is dry, sand as desired. I like to fade the text a little, and get all the edges and front so a little of the stain shows through, and looks distressed. You can sand as much or as little as you like. Wipe off the excess dust with a lint-free cloth. //Now you’re ready for the frame! You’ll need to cut your furring strips to length first, based on the size of your board. If you have a 3 foot board, then you’ll need two-36 inch pieces to along the bottom and top of your sign. 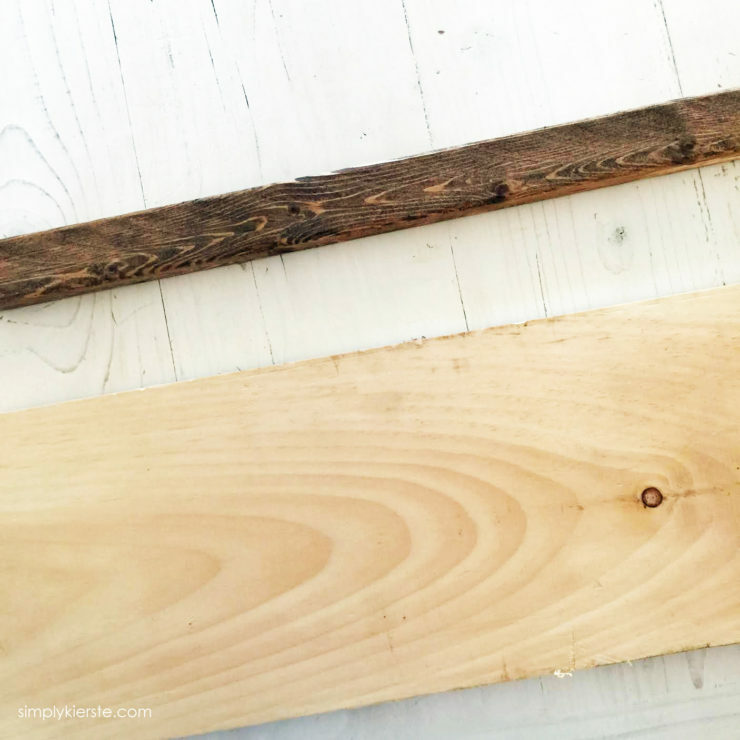 Place one strip (the wide side) against the top of your sign, and adhere with a little wood glue. Be careful–it’s not very wide, and the glue can squeeze out if you use too much. Repeat on the bottom edge. Measure how tall the sides of the board are now that the strips have been attached, and cut two more pieces of the furring strips to go on the sides of the board. Repeat the above process and glue on the sides. //Add the nails around the edges for further security. We used a nail gun, but that’s optional–you can certainly use a hammer and nails too. And that’s it! 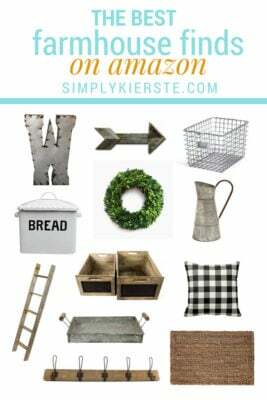 You’ve got an adorable Wood Farmhouse Sign! The sign looks great! I am in love with your house Kierste!!! So happy for you and your family!!!! love it! you are so talented! Does the spray paint dry quickly? Are you spraying your plate for each letter? I can’t wait to try this technique. It actually does dry very quickly, which is another reason I love it! I spray the plate as often as I need to–you have to spray it quite a bit to get enough for your brush, so sometimes I have to spray a couple of times for one letter, if I didn’t get enough the first time. I hold it close to the plate when I spray, and it just puddles up. Love your kitchen and the sign!! Would love to know what font name you used on the sign? Love the Framing. Definitely doing this one. Thanks for posting! Awesome post! That sign is awesome, and I love your kitchen! Thanks for sharing! Why do you use latex paint rather than chalk or milk paint? It’s really just a personal preference. 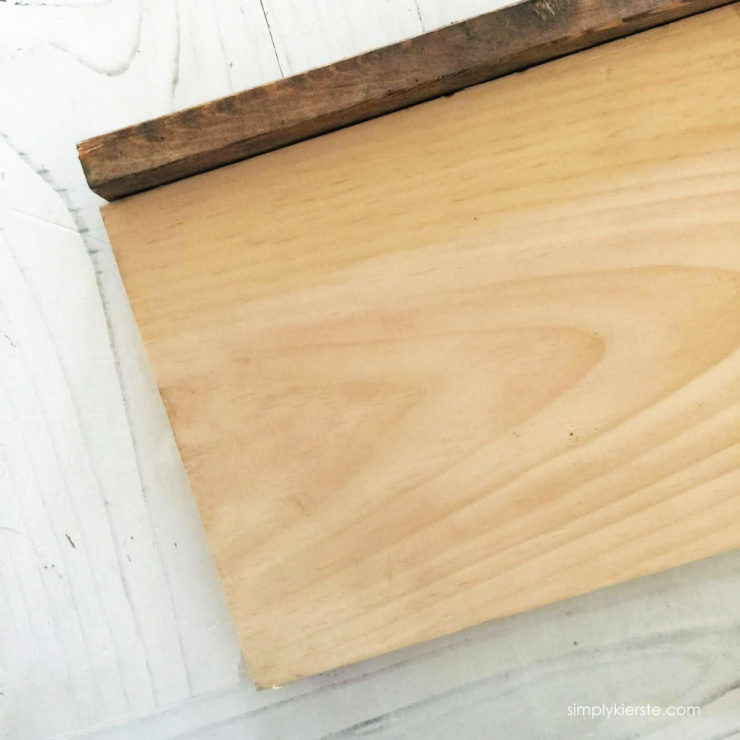 I only use chalk paint when painting laminate surfaces–or items that you would have to sand and sand before painting. You could use any of those if you prefer! What do hardware do you use to hang the sign? Sometimes we use sawtooth hangers, at other times we’ll add a wire on the back, and hang it by the wire. On this one, we used wire.